I’m extremely pleased to bring you the Conveyer Belt Airport. I didn’t read the links, but I am fairly certain the answer is no, since planes require air passing at HIgh & Low pressure around the wing in order for it to move off the ground. 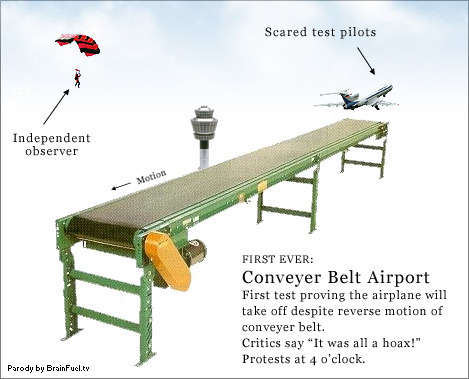 The conveyor belt concept moves the ground, not the air required to lift the plane. …Interestingly though, perhaps someone ould build an “air tunnel” that moves the air passed the plaes wings at a speed fast enough for it to lif off the ground…the problem then is that there is no momentum to carry the plane forward…so it would just sit there and hover until the air stopped. I agree with Jeff. The thrust of the engines would be useless if the conveyer belt neutralized the airplane’s speed and the air passing around it. Jeff: Oh, Jeff. What RSS reader-less rock have you been living under for the last, oh, 48 hours? It’s all in the links, man. Chris: You guys always come in perfectly timed to shatter the tension with a little fit of laughter. I was one of many whose brain actually leaked out my eyes and onto my desk the other day. I’ve talked several people up about it and only really believe after seeing Matt’s link. Well done, as ever. The genaral argument is that the wheels on the plane don’t affect ANYTHING having to do with the thrust of the plane…which I agree. It is then said that the airflow of the engines/propellar moves the air providing the thrust to take off. IMHO, this doesn’t work and here’s why….GRAVITY!. Gravity on the air around the plane & wings of the plane. Normally, the thrust produced by a jet engine moves the air froom the front of the engine, to the back of the engine. This movement of air is what in fact causes the plane to move forward, and this movement forwward is what causes the high/low pressure over the wings of an aircraft to provide lift. By placing a plane in a stationary position ( The riddle states the conveyer belt equalizes with the wheels), there is NO airflow over/under the wing. I believe the jet engine does NOT cause airflow over the wing, rather it causes propulsion through the air, and with the conveyer belt canceling out that propulsion, no lift can be applied! …unless the pilot has the breaks on. ….yes, I understand that idea, but still disagree. Propultion from the jets engines in my mind can NOT exist without forward movement. Otherwise, the engines are just spitting air from in front to the back of themseles…there is no air moving around the wings. So, in the case of his riddle, thrust is irrelavent…it is Lift that is crucial. No airflow (around the wings specifically), no lift. The confusion from this riddle is due to the fact that it’s worded to make you think that the plane is not allowed to move forward. So everyone says, “no. of course it can’t take off”. But in reality, the plane is able to take off because it *is* able to move forward. Its jet engines are at full throttle and it *is* moving down the runway. Admittedly, its wheels are spinning like crazy, but it doesn’t matter, because the jet engines are using the air to push the plane forward. The jet engine is not related to the conveyor belt at all. Planes don’t use their wheels to propel themselves towards take-off. They use the air. On another note… Here’s another riddle for you. Scenario: There’s a two-story barn that is facing east to west. If the wind is blowing at 25 mph from the north, and a rooster lays an egg on the very peak of the roof of the barn… Which side of the barn will the egg roll down and fall off of? The left side, or the right side? Answer: Neither Side. Roosters don’t lay eggs. Haha, that’s awesome. I actually got it before I read your answer. Good one. haha… Yeah I really got nailed by that riddle when I was like 4 years old. How the other children laughed. Sure, a plane taking off on a real conveyor belt should take off fine (though I asked recreational pilot I work with and he said the tires would probably pop… but anyway). The question to me came across as implying this is a ‘magic’ conveyor belt, that can in fact keep the plane in place relative to the ground (the idea that this isn’t how it would work in reality was irrelevant), in which case, of course it wouldn’t take off. The wheels do not have enough friction to hold back that much horsepower. This problem can be understood quite simply by considering the example of a plane with frictionless bearings in the wheels. Examine the case when no thrust is applied and the conveyer moves at any speed. The plane will remain motionless with respect to the ground while the wheels spin at the conveyer speed. Now apply some thrust and the plane will start to move forward relative to the ground because in this case the speed of the conveyer (with frictionless bearings) can have no effect on the plane motion. As you increase thrust the plane will take off just like a normal plane. In fact from an observer on the ground the take-off will look perfectly normal. Now add some friction to the bearings and the only thing you will have to do is add a little more thrust to overcome this friction. Again from an observer on the ground the take-off looks exactly the same with the exception that the wheels seem to be spinning too fast. This is different from a car because the car must have locked (not frictionless) bearings (at least in one axel) in order to move. The correct answer is that we don’t know. The runway might not be long enough for the plane to take off, the plane might not have enough fuel, or be overladen. It might be about to explode due to a malfunction. So all those people who argue either way are making assumptions they cannot know are true from the description of the problem. However, it can take off from a purely physical perspective, there is nothing to stop it there. Its not a car with wings. It moves forward because of the thrust of its engines, not by pushing against the ground. The conveyor speed is irrelevant. It will take off with the landing gear seeing a speed of twice whatever takeof speed is. the thrust must overcome the negative motion of said conveyer belt9ground0 lift is applyed only when air movementb is positive in overcoming negative motion the plane must move and air flow must move positive motion for lift.. no matter what speed of tires or ground said conveyer… you must obtain said lift.. sin cerily wiley cyotre geniiouuuse..
Look at it this way – What do the tires on a car move you with respect to? The road. Now what does the engine of a plane move you with respect to? The air!! So if the required air speed for a takeoff is 100mph – then the air must be moving across the wing at 100. if there is a head wind then the plane can use less thrust, whereas if there is a tail wind it will need more. Now the plane will move with respect to the air as before, the tires just make it easier for the plane to get across the runway. As stated above the tires will only be moving at twice the speed of the plane. Right, for an aircraft to take off, it is propelled down the runway on wheels by engines. with me so far. The plane has to travel on the runway until it reaches v1 or v2 which is the speed at which the pilot says rotate, pulls back on the control column. you get the lift and it leaves the runway. Now, the conveyor runway is linked to the speed of the aircraft, which means if the plane is going 120 knots, the conveyor is doing the same in the opposite irection. A stationary aircraft, means no lift which means no take off. I thank you. Subject : Purchase of Conveyor Belt. Very soon Civil aviation Authority of Bangladesh (CAAB) take necessary action to purchase two Conveyor Belt. I hope CAAB call tender for this comming last of April, 2008. I am Md. Abdullah Kaiser a business man in bangladesg and my company name is : POWER MATRIX LTD. I perform my business in Various department in Bangladesh. If you interested complete your business in Civil aviation Authority of Bangladesh (CAAB) about Conveyor Belt via with my company(My company is your local agent) then you please inform me. After your information I send to you my company profile as a attached file via e-mail. After reading my company profile and reply me. If you read my company profile then you found everything about my company that means-corporate information, telephone & fax number, web address etc. If you search my company web address then you also found information about my company. If you have no local agent in Bangladesh or you interested complete your business in Civil aviation Authority of Bangladesh (CAAB) about Conveyor Belt via with my company then you please inform me. After your positive reply I send you the specification of Conveyor Belt and whole tender document via e-mail or postal mail. After your reading the specification of Conveyor Belt and whole tender document. And this moment if you interested then I and You complete our aggreement and discuss about price etc. If you have any query about me, my company, about my business and about this tender etc then please inform me. The wheels do not have enough friction to hold back that amount of sheer horsepower.